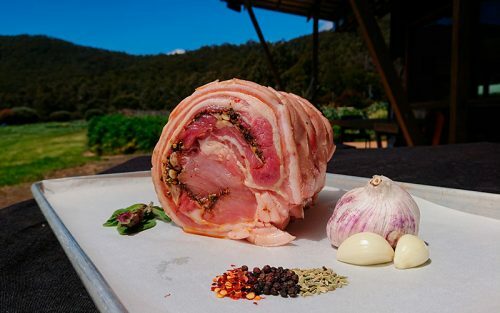 A classic Italian roast pork dish, we will prepare it by rolling one of our rare breed pork loin and bellies, with spices and fresh herbs from the garden. To cook the porchetta roast, smear the skin with olive oil and salt then cook in a pre-heated oven at 230 degrees for 30 minutes then cover with foil and cook at 120 degrees for 4–5 hours. After that remove the foil and cook for another 20 minutes on 230 degrees. Choose a size from 2–4kgs. 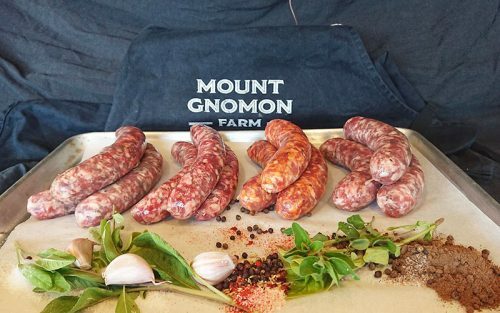 Two kilos of mixed gourmet sausages, including our signature Beef, Pork, and Plum, Traditional Pork, Pork and Fennel, Toulouse, Lamb and Mint and Pork and Paprika. All of our sausages are preservative and gluten free, made by us using our own ethical meat and original recipes. We also use fresh herbs from the garden where possible and freshly cracked Australian farm sourced pepper. They are delicious and will make a great addition to boxing day barbecues. A selection of our most popular beautiful free range small goods. 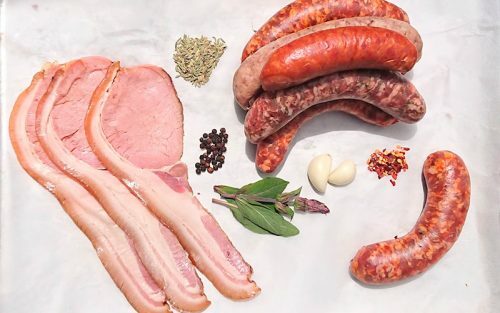 Packs include our famous home smoked chorizo, bratwurst and bacon, along with some of our most popular artisan pork sausages, such as pork and fennel or traditional pork. 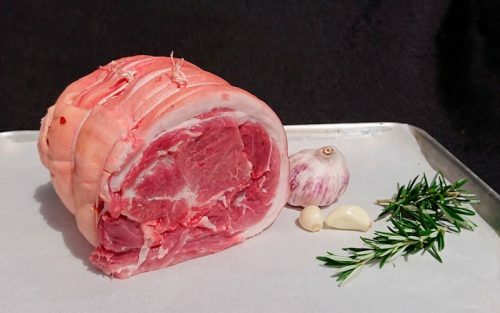 Our rare breed rolled shoulders are perfect for the spit roast or oven, these are more suited to slower cooking than the rolled loin, so perfect for the webber. Arguably more flavour than the loin, the crackling from the shoulder is delicious. 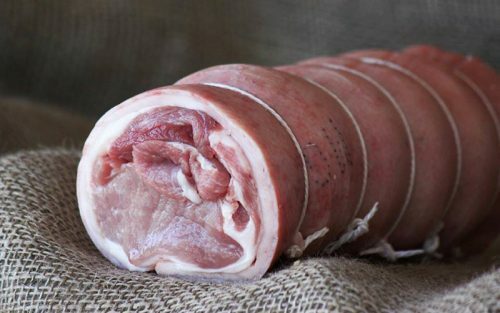 Our rolled loins are made from our free range rare breed pork and are beautiful and sweet when roasted. Season the skin with salt and pepper and enjoy crispy crackling. Deposit: $15kg with the remainder paid on pick up. Boneless half hams are great for either glazing and eating fresh. These are the hams for you if you prefer an easy carve option. They are prepared in a traditional manner, with our free range rare breed pork legs and smoked with oak. A deposit of $50 secures your order with the remainder being paid on pick up when we know the final weight of your ham. 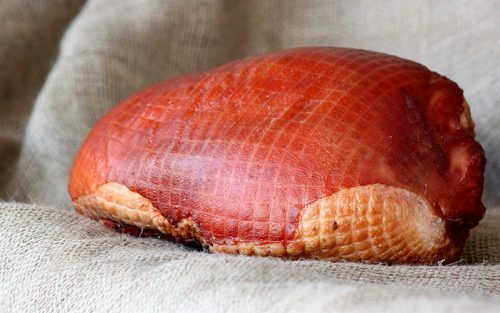 Whole boneless hams are great for either glazing and eating fresh. These are the hams for you if you prefer an easy carve option. 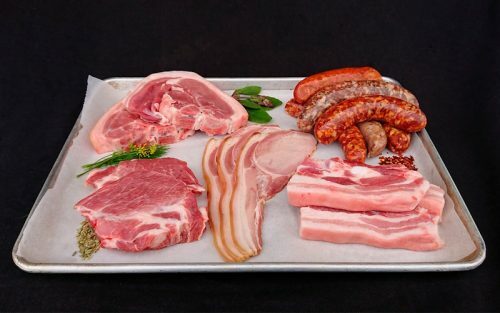 They are prepared in a traditional manner, with our free range rare breed pork legs and smoked with oak. A deposit of $100 secures your order with the remainder being paid on pick up when we know the final weight of your ham. 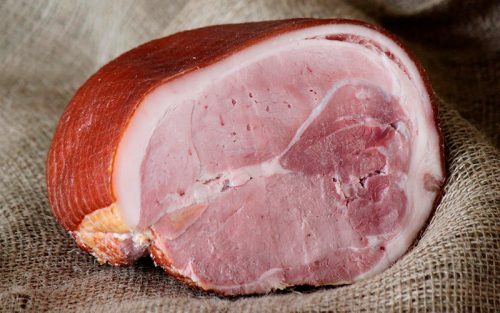 The xmas table showcase, our free range traditional bone-in ham is beautiful either glazed or eaten fresh and will be sure to impress your lunch guests. 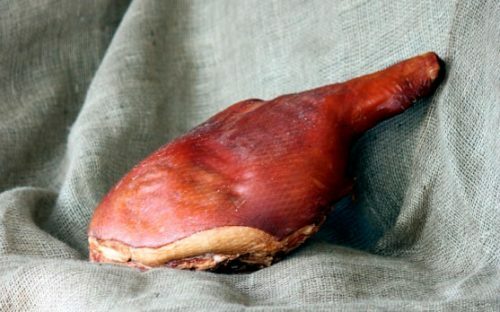 Its made in a traditional manner, using our free range rare breed pigs back legs and smoked with oak. It comes in either the hock or chump end; if you really have a preference please let us know in the comment box during check-out. Your order is secured with a $50 deposit with the remainder paid on pick up when we know the weight of your ham. The Xmas table showcase, our free range traditional bone-in ham is beautiful either glazed or eaten fresh and will be sure to impress your lunch guests. Its made in a traditional manner, using our free range rare breed pigs' back legs and smoked with oak. We cap the price at 8kgs worth if the weight exceeds 8kgs. Your order is secured with a $100 deposit with the remainder paid on pick up when we know the weight of your ham. This gift voucher entitles free entry for two people and is valued at around $100.